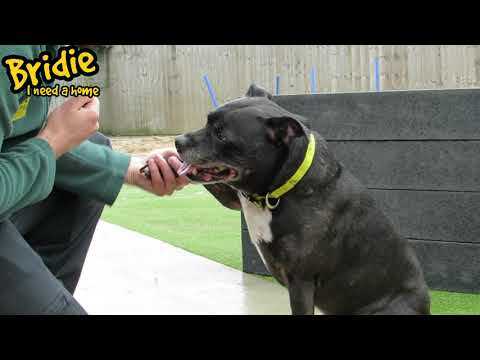 This absolutely gorgeous girly is Bridie! She is a sweet 11 year old Staffordshire Bull Terrier looking for her forever home that can provide her with endless amounts of cuddles and belly rubs! Bridie adores spending time with her human friends and will take any fuss she can get- she loves to sit close for a fuss and really enjoys having a brush! Bridie may be an older girl but she is full of life and enjoys being out on her walks and would definitely find it fun to learn new things! Bridie would like a quiet home where she can relax whenever she pleases. She would request a secure garden where she can potter around and do her own thing. Bridie can live with children aged 8 years and over. She will need to be the only dog in the home with owners who can continue her training around dog socialisation. If there is a Bridie shaped hole in your life and on your sofa please come down to the centre so we can introduce you to this sweet girl! Thank you for your interest in Bridie, who is based at Manchester. Please note this is not a reservation on this dog. To start the rehoming process you will need to go to a rehoming centre for a quick chat. Please find information below about what to expect during the rehoming process. We hope to see you soon.